Powers: Harley can generate deafening sound or destructive blasts of sonic force from her cybernetically enhanced larynx. She is immune to the direct effects of the energy she generates. She can teleport across space and between dimensions via MOPED technology which has been built into her body. This technology also contains micro computers, which can warn her from threats outside her field or range of senses. Via humming at a low pitch she can see through solid objects, and she can often sense various forms of energy. She wears a bulletproof jacket. Her vocabulary would make a sailor blush. 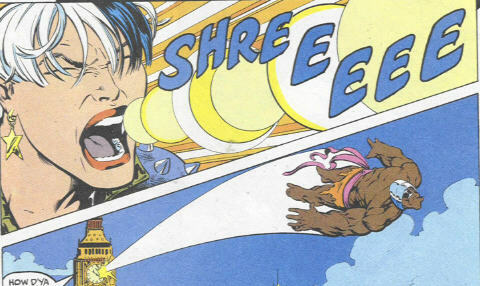 She has also used a variety of Mys-Tech weaponry, such as the S.C.A.R.E. (Sound Concentration and Amplification Resolver) gun. History: (Motormouth#2/2-file) - Harley, having no family since she was 11, became part of a gang living in deserted riverside buildings in the East End of London. With no education and being totally unfit for employment, Harley survived on her wits, stealth, and cunning. Her extreme agility and aggression allowed her to survive and hold her own amongst the other gang members. Her readiness to verbally abuse anyone earned her the nickname Motormouth. Harley's gang survived by "finding" what they needed to survive, but they had no sense of loyalty whatsoever to each other. Harley's personal belief system was look after number one. 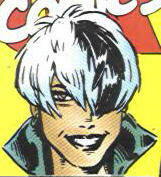 (Motormouth#1) - Harley Davidson was a 17 year old street orphan living in London, England. Laarson, an agent of Mys-Tech, had been testing the M.O.P.E.D., Mind Operated PErsonal Dematerialization, technology, which had resulted in the deaths of the subjects and the destruction of two of the four units. Laarson found a perfect alpha wave match in Harley and sent the units, in the form of shoes, to an alley in her vicinity. Harley found the shoes and tried them on. However, at the same time, Algernon Crowe, one of Mys-Tech's Techno-Wizards, executed Laarson for what he saw as gross mismanagement of the MOPED project, and sent Mys-Tech agents to retrieve the units. Mys-Tech agents were also sent to exterminate Laarson's subordinates, who attempted to prove themselves by showing that Davidson was indeed a match. They activated the units, saving her from her attackers, and sending her on a random jump, which brought her to Earth-Londinium. Harley was accosted by the Fashion Police of Earth-Londinium, but found allies in F.U.R., the Fashion Underground Revolutionaries. In the middle of a crossfire between the two groups, the MOPED units activated again, transferring her to back to Earth-616 (mainstream Marvel Earth). Back on Earth-616, two SHIELD (Strategic Hazard Intervention Espionage Logistics Directorate) agents were dispatched to London to investigate the energies released by the MOPED units. They were both killed by Killpower, an agent of Mys-Tech, who had been sent to track the units down. The deaths of two of his agents attracted the attention of Nick Fury, who headed to London himself to investigate. (MotorM#2) - Feeling that a single successful jump would not be enough to save them from the Mys-Tech Techno-Wizards, Laarson's former subordinates sent her on another jump. This time she arrived in a potential future of Earth 2191, in which most of the world was covered with immense malls. Harley's inflammatory nature soon brought her into trouble with the Mega-Mall security robots, and an encounter with a would-be thief Kevin Fothergill. After leaving the mall (with the dead thief's credits), she purchased a Soni-Muta-500 Unit, which was implanted under the skin behind her ear and would allow her to mentally tune into any radio station. When the mall security caught up to her again, she finally began to get the hang of the MOPED unit, and returned to Earth-616. (MotorM#3) - Harley was captured by agents of Mys-Tech and brought before Gudrun Tyburn. Knowing Harley was a rare perfect match for the MOPED units, Tyburn offered her a contract to work for Mys-Tech. Harley first bumped into Killpower, while walking through the halls of Mys-Tech Central. As a test, Tyburn sent her on a calculated jump to Tokyo to obtain "Tyburn's Key." Harley followed the mission, fighting off numerous attacks, only to have the shop she needed be closed. Annoyed, she managed to override the MOPED controls and aborted the mission, taking a random jump to the planet Tekron. Furious, Tyburn sent Killpower to take out Harley and retrieve the MOPED units. (Motormouth & Killpower#4) - Harley arrived on Tekron just seconds before Killpower. She tried to escape him initially, which was futile, but she then succeeded in reasoning with him. The simple and mentally immature Killpower was intrigued by Harley. When they were attacked by a group of native pygmies and then native villagers, a bullet from their attackers bounced off Killpower and struck Harley in the throat. Harley was dying, built Killpower's bio-occult conditioning had given made him a prodigy with technology. Using the MOPED and Soni-Muta-500 technology, he rebuilt Harley's throat and recovered her from near death. After reviving, Harley found that she now had sonic and enhanced visual powers. In addition, the MOPED's abilities were now part of her, and she used it to teleport herself and Killpower. (Mm/Kp#5) - Somehow, Harley and Killpower were split up, but apparently still on Tekron. Eventually they relocated each other and fought off a number of the robots that attacked them (including Skordos). Harley grabbed a new set of duds from a museum, and they teleported off again. (Battletide#1, [2, 3], 4) - Harley and Julius took a vacation on the South Pacific Island of Kamuni Atoll. However, Death's Head was hired by Algernon Crowe (of Mys-Tech) to recapture Killpower. Death's Head, Tuck, came along to prevent Motormouth from interfering, but Harley opened a warp and tackled her through it. Death's Head and Killpower were pulled into a set of war games then culminated in a battle against Termagaira and the Battletide. Meanwhile, Tuck and Harley quickly became friends and had a shopping spree on the planet Aldebaran. (Mm/Kp#6) - Harley and Killpower arrived on Matricca Scorpio, the legendary factory planet. Mys-Tech tracked the pair to that planet, and Tyburn had the Psycho-Warriors sent after them. The Warriors defeated and captured Julius, but Harley obtained his MOPED unit, leaving her with both, and Mys-Tech with none. Harley planned to follow Julius back to Earth, but she was intercepted by the Dove Soldiers, agents of the Asuza Cynergetic Engineering (ACE) Corporation. (Mm/Kp#7) - Harley fought off and escaped the Dove Soldiers, but was then captured by the Bad Boys, agents of the ACE Corporation. They brought her before Mr. Asuza, who attempted to inquisition her, but unwittingly removed her mouth gag and had his head blown off as a reward by Harley. On the way out of the ACE Corporation she bumped into the Dove Soldiers again, but then transported off Matricca Scorpio. (Mm/Kp#8) - Harley returned to Earth and teleported into Mys-Tech Central. Tyburn attempted to capture her, but Harley blew her to pieces. Harley found Julius undergoing a session in the Truth Centre under Mullarkey's guidance. Harley knocked out Oonagh and freed Julius, who persuaded her not to kill Mullarkey. Meanwhile, Tyburn, an immortal, had pulled herself back together and sent a squadron of guards after them. While fleeing, they bumped into Rathcoole, another Techno-Wizard, who warped them into an experimental research area, where they ran into a monstrous creature. (Mm/KP#9) - Harley and Julius escaped the creature, and they located and destroyed the tracking bugs Mys-Tech had implanted on them. They decided to try to raid Mys-Tech's weapons depot before escaping. Their next jump brought them to the Crossroads of Time where they met the current Time Guardian before warping back to Rome @ 55 BC, where they appeared in the midst of Emperor Julius Caesar's games. After defeating all other combatants, Harley warped them away once again. <---------> - Harley had some adventure in an unknown place. see comments. (Mm/Kp#10) - Harley returned to Julius' side to find that he had made nice with Sabra. The three of them fought off some Were-Men and then raised an army to take down Qaar Ghoth. The army wore down Ghoth's defenses and drained his remaining magical stores, but he made a trap for Harley and she slipped into "the Sleep of the Dead" after pricking her finger on a poisoned brooch. Following the prophecies of the land (and the plot to Sleeping Beauty) as dispensed by Sabra's ally Margreth, Julius kissed Harley and awakened her from her coma. The two teleported away for another adventure. (Mm/Kp#11) - Arriving on Earth-93411's potential future of 2195 AD, Harley and Julius joined forces with Zachary Sorrow and CARE (the Citizen's Assistance Resource Executive) against the Electro-Vampires. 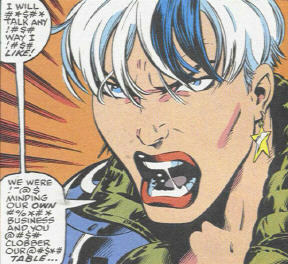 Harley herself slew Rakulon, the leader of the vampires. They picked up a few more weapons from that future world before hopping away again. (Mm/Kp#12) - Harley and Julius returned to Earth and joined forces with Death's Head against the Metamorph, a renegade creation of AIM. (Mm/Kp#12/2) - On the planet Fautor IV, Julius enraged 40, 000 dedicated worshippers by telling them that "Kipple" was a stupid name for a god. The High Priest summoned Kipple himself to punish the blasphemers. Harley was quick to point out Julius as the guilty party and watched as he defeated and slew Kipple, becoming the new object of worship of the people of Fautor IV. Dark Guard eventually uncovered and the mastermind behind the plot, Tyburn, and restored peace negotiations on Eopia. (Incredible Hulk II#408-409) - Harley and Julius returned to London to take a $@*#! vacation. Their plans took a slight turn when the Hulk fell out of the sky (after a fight with Madman aboard his ship) and landed on their lunch table. The Hulk quickly took out Killpower when he attacked him, and Harley started out by giving the Hulk quite an earful, but he was more than happy to give it right back to her: "Listen, Lady! I'm the#$#* Hulk! And I'm not taking your @#+!, okay! It was a #*%* accident, got it?!" Anyway, after the Hulk explained what had happened, Julius was more than happy to join the fight against Madman, despite the Hulk's instructions to stay out of it--and Harley ran after Julius to keep him out of trouble. Harley and Julius climbed up Big Ben and caught Prince Charles when Madman tossed him off the top of the giant clock. Madman attacked them, but Harley blasted him in mid-air and knocked him across the city. The Hulk and Madman's fight culminated with London Bridge falling down, and Harley and Julius helped the Hulk search the wreckage, but there was no sign of Madman. (Captain Britain and MI13#11) - While in hospital Motormouth reported to Pete Wisdom what had happened at the Hussain's home. Harley Davidson...get it?...ha, ha, ha, ha, ha...eh...that's not funny. Hyrkania is the name of the land from which Red Sonja originated or dwelled, in the Hyborian Era. I think the version visited by Harley was another dimension altogether, a world of swords and sorcery, named as an homage to Sonja/Sonya. 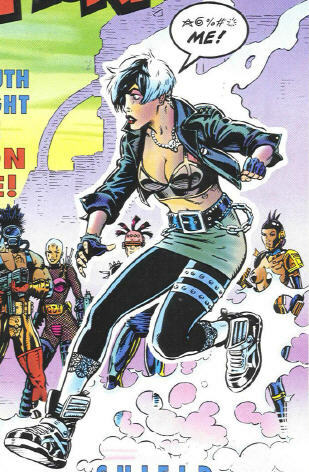 When Harley was teleported away by Sabra, a footnote claimed that she had an adventure that would be revealed in later issues. I don't think it was, though. Male Pig Joke--skip it if you don't want to be offended. Motormouth, Jeff Christiansen, aka Snood...the nickname I received from my pediatrician @ age five. What does a moped and a fat chick have in common? They're fun to ride, but you don't want your friends to see you on them.